Trae Young shoots the ball against the Indiana Pacers during the season’s final game at State Farm Arena. 1. The Hawks will have one of the NBA’s youngest—and most exciting—teams next year. Few teams will have starters as young the Hawks’ lineup. 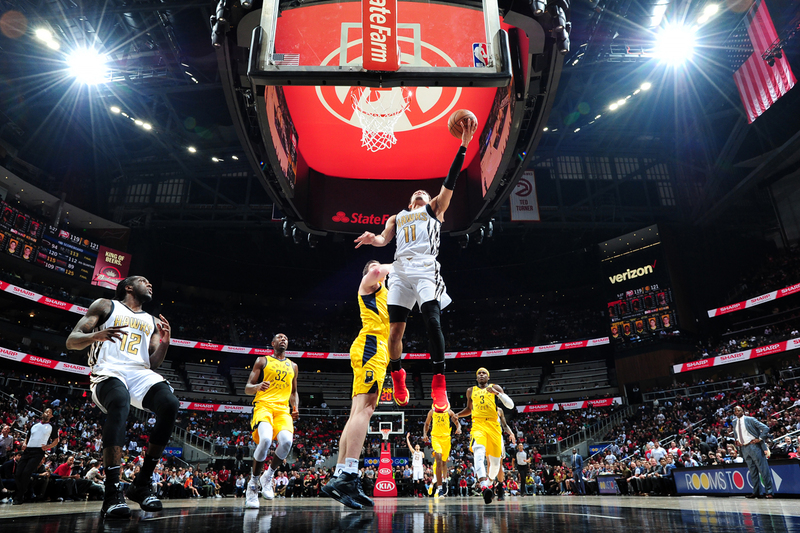 John Collins, 21, and Trae Young, 20, scored a combined 24 of the Hawks’ 41 second-quarter points during the during Wednesday night’s finale. They have taken on the bulk of the team’s scoring load this season—Collins leading the way with 19.5 points per game while Young averaged 19.1 points. Collins also led the team in rebounding with over nine per game, while Young was the leading assist man with 8.1 per game. Rookie Young’s energy is tireless. “Now that [the season’s] over, it’s time for me to take a little breather, and then it’s time to get back to work and get ready for next year,” he said after the game. Young played in 81 games this season. Only DeAndre’ Bembry, 24, played more—82 games. The other 20-year-old guard, Kevin Huerter, finished the season with a 10-points per game average, good enough for 10th among rookies in the league. Huerter also shot 38.5 percent from three while averaging three rebounds and three assists per game. He scored 17 points in the season closer and looked every bit like a starting shooting guard. To have three players 21 years or younger contribute on that level is a great sign for a team climbing back into contention. 2. Did we mention the addition of young talent every year? Atlanta (29-53) will come into this year’s NBA draft on May 14 with not only its own lottery pick (top 14 slots in draft), but potentially with the lottery pick of the Dallas Mavericks (33-49), who also missed the playoffs this season. The Mavericks and Hawks traded picks last season—Young and Mavericks rookie forward Luka Doncic—with the Hawks receiving Dallas’s lottery pick this season if it falls outside of the top five. This deal will last through 2020 before the pick becomes top-three protected for the another two years. The Hawks also have a top-10 protected pick from Cleveland this year and next. If that pick stays put, the Cavs will have top fork over two second round picks to the Hawks during the 2021-22 season. While the odds of the Hawks getting the number one overall pick are a slim 10.5 percent due to their having the fifth worst record in the league (behind the New York Knicks, Cavaliers, Suns, and Bulls), the odds of Atlanta drafting within the top four picks like last year are much higher: 42 percent. Taurean Prince shoots the ball against the Pacers during Wednesday’s game. Wednesday night’s loss to Indiana could be used as a perfect example of the Hawks’ ability to take a punch and keep fighting—something that could not always be said about last year’s team. 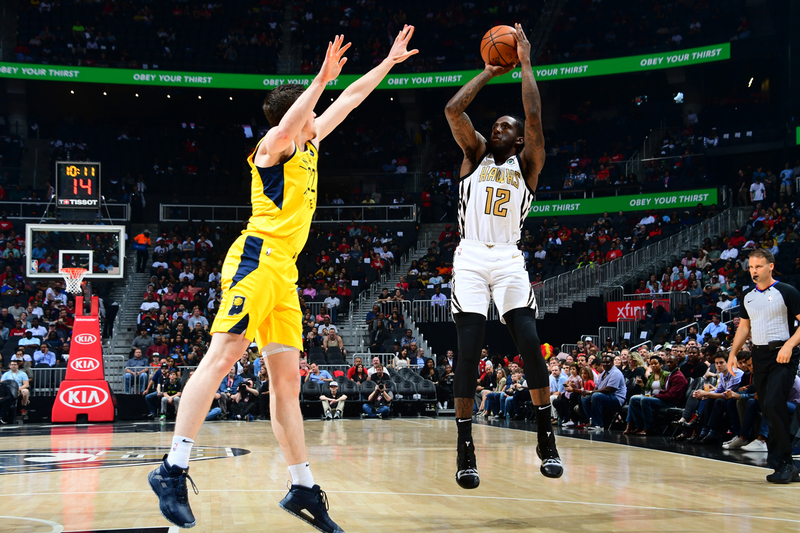 During the fourth quarter, the Hawks fell behind by 11 points early in the period before a dunk by Collins, three-pointers by Taurean Prince and Justin Anderson, and baskets by Young, Alex Len, and Bembry brought the Hawks back to an eventual 124-124 tie with 4:09 remaining in the game. This type of scoring from multiple players during an crucial point in the game is arguably reminiscent of the 2014-15 team that won 60 games and made it all the way to the Eastern Conference Finals. A stretch, potentially, but the seeds are definitely planted for a successful generation of quality basketball. The knock on third-year guard Bembry, who the Hawks drafted 21st overall in 2016, has been his health. Bembry played in 38 games as a rookie and in 26 games last season, displaying immense potential but having yet to pull it together for an entire season. But this season has been the best of Bembry’s professional career and leaves him—and by proximity, the Hawks—on an upward swing. He played in a career high 82 games while average highs in scoring (8.4), assists (2.5), rebounds (4.4), and steals (1.3). At 6′ 6″, Bembry gives Atlanta a backup guard, forward, and playmaker due to his ability to run the offense off the bench. (He also started a career-high 15 games this season.) For any team to be good, there has to be reserves that can play like starters, and Bembry displayed that ability this season. One of the best moves the team has had in the past couple of years has been the hiring of first-year head coach Lloyd Pierce. A Bay Area-native and former guard at Santa Clara University (he played in the backcourt alongside some guy named Steve Nash), Pierce came to Atlanta from Philadelphia with a reputation for working well with young players (see Joel Embiid, Ben Simmons), and that has come to pass this season. From Collins to Young to Bembry to Prince, all have improved their play from the beginning of the season to Wednesday night.